At this point, they will often freak, but I tell them that I only ended up studying Physics because I was rubbish at Art, and if I can do it so can they! First of all get the axes right. Measure up the y-axis and label from +15 at the bottom to -15 at the top, and label as absolute magnitude (excellent opportunity to revise this concept here). 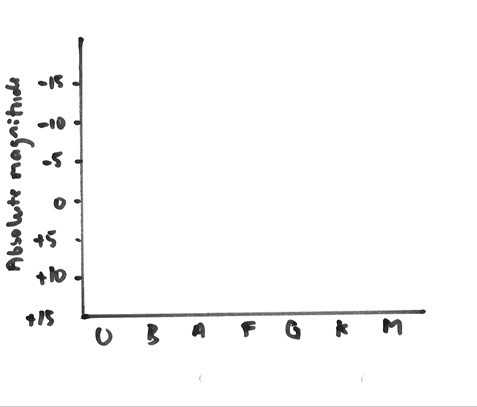 OBAFGKM along the x-axis (remind them of the mnemonic). 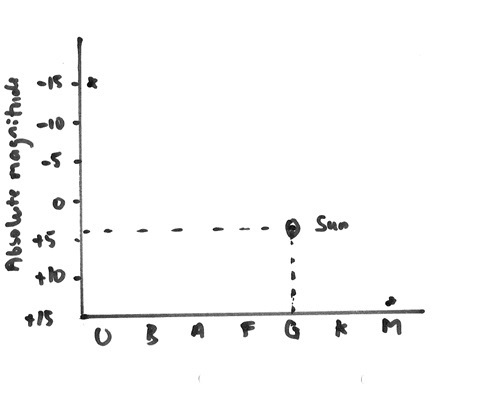 Next, a fact to remember, the Sun is a G class star with an absolute magnitude of +4. Mark the Sun on the diagram. 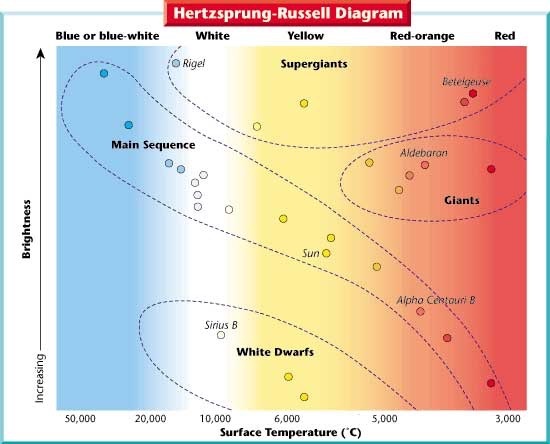 Also, we know that main-sequence stars start top left and end bottom right. Mark these with crosses. 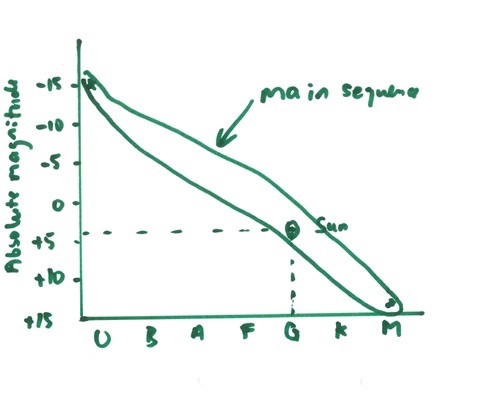 Now you can draw the rest of the main sequence band (review what this means). If you have your 3 points in the right place, it will automatically give you the right shape. 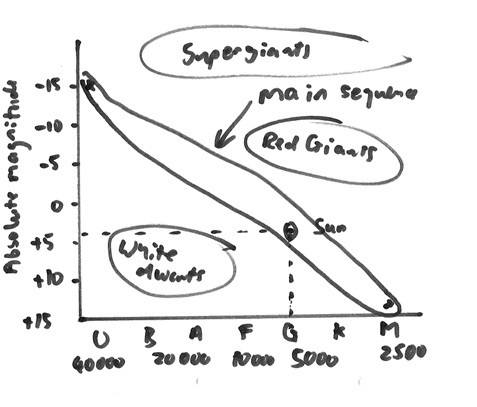 Finally draw in blobs for red giants and supergiants above the line, and white dwarfs below the line. Reassure that the exact positions do not matter. This will almost certainly get candidates all the marks, but just to show off you can now put in temperatures as well. The facts to remember are that it goes from 40 000K of the left to 2500K on the right, halving each time, and that the Sun is around 5000K. And there you are, an accurate H-R diagram drawn by people who can’t draw. What I then do is wipe the board clean, tell them to turn over their paper and draw it again on the back. Check and correct if necessary (or you could get their partners to correct it). Then later in the week I will dole out paper and ask them to draw it again as a lesson starter. The trick is to make sure they learn by doing, not by looking. I find this reassures students that they can pick up easy marks with this type of question. I imagine it is applicable to many other subjects.